This post may contain affiliate links that help support this site at no additional cost to you. Please read my disclosure page for more info. Here is a list of live Cyber Monday Sales and extended Black Friday Sales. I will be adding more sales as they go live. So be sure to bookmark or pin this page. I update it every year. Just click the store name to shop. Amazon – 30% Off Select clothing shoes and accessories. Best Buy – Laptops , iPads, TVs, cameras and more. Boden – 30% off with code V4N9, plus free shipping over $49! Body Shop – 50% off 100s of items! Plus 20% off gifts. Children’s Place -Cyber Monday Deals – Get 60 – 75 Percent Off Everything with Free Shipping! No Exclusions! DiscountMags – 3 magazine subscriptions for $12, 5 for $18 , or 10 for $30 – these make great gifts! Gap – Get 50% off everything, includes brand new styles! Use code CYBER . PLUS stack code YOURS for an extra 10% off and FREE shipping no minimum. Hanna Andersson – EXTRA 40% off everything, and $25 kids pajamas, FREE SHIPPING on all orders. New customers save 15% on their total order with code HOLIDAY15. H & M – 30% off everything no exclusions and free shipping. Loft – CYBER MONDAY: Free Shipping + 50% Off Everything And More with promo CYBER. Mabels Labels – Get 40% Off Mabel’s Labels Favorites, Plus Free Shipping! Minted – 25% off everything including Holiday Cards – If you are not ready to actually make your cards today you can still buy and save to make them later – Details on buy now personalize later program here. Old Navy -Free Cozy Socks with Any Online Purchase. Use code COZY + 50% off Everything. Online only. Limited time. Restrictions apply. . Need some ideas on clothing check out our capsule wardrobes. Rent The Runway – 50% off unlimited rentals. This is great for upcoming Holiday parties & New Year’s Eve! Stella and Dot – Shop and save with Stella & Dots Cyber Monday Sale: Up to 60% OFF flash sale items! Target – 15% off almost everything no code needed just put items in cart- and BOGO 60% off clothing plus extra 15% off -FREE shipping on everything! Great day to stock up on anything you need at Target. Looking for more coupon codes? Be sure to check out our online coupon code database with 1000s of online coupon codes. Here is a great deal! The Hanna Andersson Cyber Monday sale is and extra 15% off plus FREE shipping with no minimum. Their shipping is expensive so this is a great savings!!! Plus the 15% off works on top of sale prices!! If you have been wanting anything from Hanna Andersson, today, Cyber Monday, is the day to buy! Be sure to check out our HUGE list of Cyber Monday sales and coupon codes here. I am working on getting a bunch of Cyber Monday deals up for you but if you are shopping be sure to always look for an online coupon code that you can stack with the amazing Cyber Monday sales. I have a database with 1000s of online coupon codes be sue to check there before you order today or any day. Cyber Monday Deals at Amazon is still going on at Amazon. Be sure to bookmark this page because there will be plenty of lighting deals and more going on. The best lighting deals sell out quickly so be sure to look at the hints now for the lightning deals so you are back and ready to buy when they come online. There are some good deals in the Cyber Monday Video Games Sale plus there are great deals in the Cyber Monday Toy Sale and Lightning Deals . Cyber Monday Deals in Week in Books is going on as well. There are a bunch of great offers. There are sales of Children’s books, Best Books of 2011, Cookbooks are more! One of my favorites offers is the Buy 3 books Get 1 Free promotion. You order any four eligible books under $10 and get the lowest-price book free! There are quite a few Cyber Monday deals still available today in case you missed out yesterday. Amazon Cyber Monday Deals Week is going strong with tons of sale and Lightning deals! 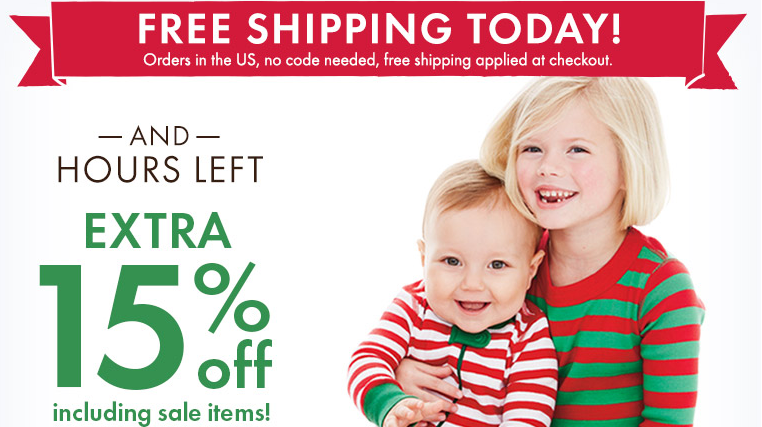 FREE Shipping is still available on everything at Pottery Barn Kids – Looks like no longer at Pottery Barn Teen and Pottery Barn except on certain items. However, the cute messenger bag for just $9.99 still ships free! Stila Warehouse Sale — Cyber Monday Up to 80% Off & FREE Shipping. This amazing sale is still on! Vera Bradley Cyber Monday Sale — Deals on Duffle, Bookbag & Hipster. Amazing prices on these bags that would make great gifts! KidKraft Annabelle Dollhouse $99.99 Plus FREE Shipping – This price and Free Shipping has been extended through December 3! 50% Off Everything at Ann Taylor & Loft Plus FREE Shipping No min. This has been extended do to all the website problems yesterday! 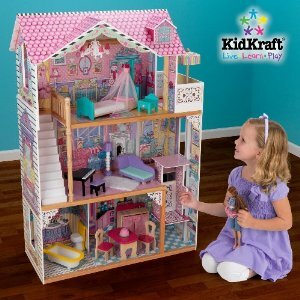 The KidKraft Annabelle Dollhouse, is a dream gift for any little girl. From the molded latticework to the chandelier hanging from the ceiling, this dollhouse is full of gorgeous details sure to put a smile on any young girl’s face. Wide windows let kids see their dolls from different points of view. Accommodates fashion dolls up to 12″ tall. It is marked down to just $99.99 plus Free Shipping at Mejier.com . This amazing price is good today only though for Cyber Monday. For reference on what a great price this is, the KidKraft Annabelle Dollhouse is almost 50% off at Amazon and is still priced at $116.00. Ann Taylor and Loft have a great Cyber Monday Promotion. There is a 50% off Ann Taylor coupon and a 50% off Loft Coupon! This works for everything online!!! Plus both stores are offering FREE shipping with no minimum purchase! At Ann Taylor, you will need to enter the coupon code MONDAY at checkout. At Loft, you will need to enter the code SHOP50 at checkout. The 50% coupon code works on full priced and sale items. There are some serious bargains if you look in the sale section. I love the accessories at both these stores. There are cute ruffled scarfs at Loft that will be just $15 after the discount! 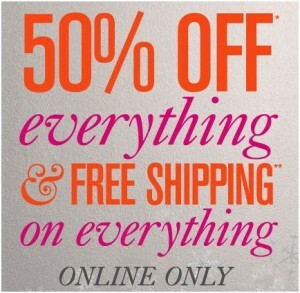 Get 50% Off Your Entire Order & FREE Shipping At Loft Today! Get 50% Off Your Entire at Ann Taylor & FREE Shipping Today! It is almost impossible to get a discount on Apple products especiallylaptops. That is why I was so excited to find this deal. The Apple MacBook Pro MD313LL/A 13.3-Inch Laptop (NEWEST VERSION) is marked down $149.01 to $1049.99. I know that doesn’t seem like a huge amount of discount but for an Apple MacBook Pro this is a great price. Cyber Monday Specials have started at Vera Bradley! You can buy the Large Duffel for $49.99, Bookbag for $39.99, and Hipster for $29.99! The bookbag is regularly priced at $92 and the duffle is regularly $84. People will think you splurged on their gift when you know you got a bargain! This special is good today only! I have a Hipster bag and love it! It is perfect for trips. Tweens, Teens and College girls all would love the Duffle or bookbag too! These would make great gifts. There is also still Free Shipping on orders of $75 or more at verabradley.com! Shop the Cyber Monday Specials: Large Duffel for $49.99, Bookbag for $39.99, and Hipster for $29.99! The Pottery Barn Family of stores is offering FREE Shipping in honor of Cyber Monday. If you check the sale section on each site you can find some great deals. I love this doll backpack and lunch box. It comes with wooden accessories include a water bottle, spork, soup container, and notebook. It is on sale for just $14.99 shipped! There is an adorable doll desk you might want to consider to for just $36.99. All this accessories will work with American Girl dolls. 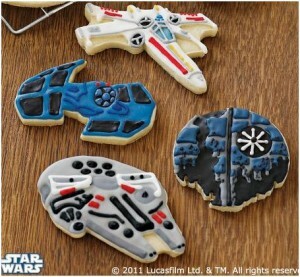 These Star Wars Cookie Cutters are just $9.99 shipped! There are lots more items that you will want to check out with FREE Shipping At Pottery Barn Kids. There are lots of great gift ideas for the tweens and teens on your list with FREE Shipping at Pottery Barn Teen. There are tons of bags on sale that would make great gifts. 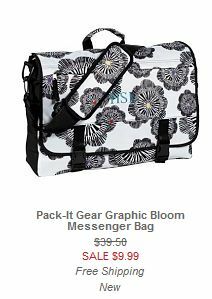 I love this messenger bag that is on sale for just $9.99! The FREE Shipping at Pottery Barn is good today as well. This is a great time to pick up lovely items at Pottery barn. Be sure to check out the sale section for the best deals! Boden and Mini Boden are offering a 30% off Boden & Mini Boden coupon code with Free Shipping at Bodenusa.com. This coupon is good today only for Cyber Monday. This is one of the best coupons you will ever see for Boden and Mini Boden clothing. 30% off Boden & Mini Boden coupon code with Free Shipping at Bodenusa.com. I'm a busy mom, avid shopper, travel lover, and real life fashion fan, striving to live my best life everyday. I love to share tips & tricks for busy moms. Contact About Me New Here? Everyday Savvy is a participant in the Amazon Services LLC Associates Program, an affiliate advertising program designed to provide a means for sites to earn advertising fees by advertising and linking to Amazon.com.